Today’s Middle Grade book title is published by WackyBee Books and is a story that taps into the current push to gain a greater understanding of mental health, particularly in boys. He skips every second step when he takes the stairs, taps door handles twice and positions objects in pairs. The problem has become so bad that Felix is on the verge of being expelled from school because the principal has had enough of trying to run the school around his very specific rules. Then Charlie Pye arrives and turns his world upside down. She’s grown up with very few rules. She eats cereal for lunch, calls a boat home, and has a very loose interpretation of school uniform. The question is, can Felix ever learn to be wrong when he is so obsessed with being right? Sally Harris grew up in rural Australia and after graduating from Cambridge with a degree in Children’s Literature, Sally has been busy writing and working as a primary teacher in both Australia and the UK. Her first book Diary of a Penguin-Napper, sold over 10,000 copies and her second book Ruby Marvellous, has inspired children all over the world to try their hand at cooking exploding finger buns! Sally loves animals, including penguins, but as she can’t have one of those as a pet, she has found that a dog is definitely the next best thing. Maria Serrano was born in Murcia, Spain where she still lives and works. After completing her BA in Arts at Complutense University in Madrid, she went on to illustrate children’s books for several Spanish publishers, all of which are still available to buy at bookshops in Spain. In the UK she has worked with Oxford University Press, Pearson Education and Templar books amongst others. She is represented by the Plum Pudding agency. We join Felix’s story when he is already reliant on rules and patterns and he is in the midst of those being challenged. It has got to a stage where it is affecting his daily life, his ability to deal with change and to engage with other children. As well as being introduced to the new girl at school Charlie, Felix’s latest episode means that he is sent to see the school counsellor who starts to work with him on addressing his anxieties. I loved how the story focused on the introduction of these new characters into Felix’s life and how they both help Felix, and those around him to see things differently. Felix’s difficulties are spoken about in every day language that children would understand and I love the analogy the counsellor comes up with of ‘Basil the Bully’. I think this would be a great book for any child experiencing anxiety to read to maybe start off a discussion with parents or school staff. Or indeed it would make a great classroom read to explore with children how we can support others who see the world differently. Both Felix and Charlie are fun characters and I loved following their growing friendship. They felt very authentic to their age. Author Sally very cleverly introduces common anxiety provoking incidents into Felix’s life – some that are everyday (playing with other children at break times) and others that are often out of anyone’s control (substitute teachers who don’t know you, medical problems affecting those we love). And these scenarios help him begin to see how to deal with the uncertainty that life throws at us. The illustrations by Maria really bring the story and Felix’s thoughts to life and I particularly loved the Rool Boy comic which was an adorable way for Charlie to share her understanding with Felix. The story comes across as very realistic with no quick fix, no perfect ending but a hopeful journey. Check out the structure of the contents page which also forms part of the story. It is worth noting that the book is set in Australia and schools in the UK are set up differently. In fact children and adolescent mental health services are generally under too much demand and there is pressure for schools to focus on academic achievement. This means that when children with mental health or social learning challenges (such as Obsessive Compulsive Disorder, Anxiety, Depression, ADHD etc) are achieving academically despite them having social and behavioural challenges they are not readily able to access additional support. As an Occupational Therapist I see a huge potential role for OTs to be employed within schools addressing this more generally. Charlie even introduces Felix to an occupation that she thinks will help his anxiety. I sense a future fabulous OT in that character. One of my OT friends is exploring a PhD on this topic and I’ll definitely share this book with her, and also with friends who might have children experiencing similar challenges. Today is the start of the blog tour. Do check out the other stops for reviews and author content. Today’s post is part of the blogtour for YA Shot which is a one-day Young Adult and Middle Grade festival taking place in Uxbridge on 28th October 2015. With thanks to the wonderful Alexia Casale for letting me take part. As an Occupational Therapist (and previously a university lecturer) I was interested in looking at how bookish pursuits linked to future employability. I’ve since expanded the post slightly to not only consider how books link to health and social care careers, but also to how books impact on our health in general. I’m a writer and voracious reader so I should note my “potential” bias in raving abut how wonderful being involved with books is. 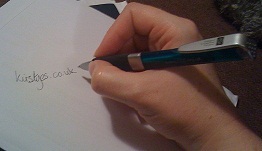 In Monday’s blog tour post by Rachel she talked about ‘doing books’ as a living. Of course, not all book lovers want to work with books, but, that doesn’t mean that we have to, or should leave books behind. My job as an occupational therapist puts me into regular contact with people, and people come with their own stories. Being able to empathise (not sympathise) with someone else is a hugely important skill for health and social care professionals (doctors, social workers, physiotherapists, etc, etc) to develop. Healthcare as a whole is revisiting Humanisation as a model for practice. It is acknowledged that sometimes viewing someone through a medical lens can make it easy to forget the person behind the body parts. In Empathy: A Handbook for Revolution Roman Krznaric shows how we can develop empathy through engagement with stories, and check out this article about learning about slavery through fiction. I often encouraged students to read fiction and use stories to make connections to theories they were learning, and also to explore the meaning of disability and diversity. I also encouraged creative expression through writing and students who engaged in these pursuits really enhanced their skills in reflective practice which is essential (in my view) for their future learning and development in practice. Medical Humanities is an emerging field of study – one which the scientific booky people amongst you might like to contribute in the future. Healthcare subjects are degree level qualifications. Rachel mentioned transferable skills in her blog post. Reading could help you develop your comprehension and writing skills (and hopefully increase your knowledge of spelling and grammar), blogging about books can help you develop critical thinking skills and your ability to express yourself verbally. Taking part in drama can give you the confidence when doing presentations or speaking out in a ward round. 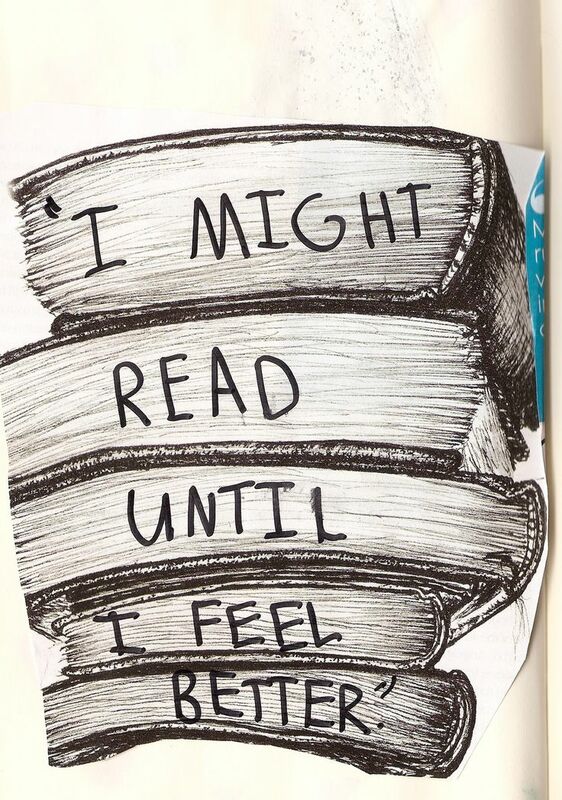 And how can reading help you look after your own health and wellbeing? Again, as an occupational therapist, I have a particular view that if reading is a meaningful occupation for you then inherently taking part in it will be health sustaining. What makes it meaningful may vary between individuals, reading may be a form of relaxation, a way to work through emotions, a way to learn or it may take you into a state of occupational flow where time flies by without you noticing it. Talking about books might be a good way for someone to begin being able to connect with other people too. For me personally I have used reading in times of anxiety to take me out of living in the past or worrying about the future to being in that story. In fact, my PhD is exploring why writers are writers, and I suspect reading will come into that somewhere! This article discusses research by neuroscientists that show that reading can enhance cognition, memory and compassion as well as reducing stress and helping sleep http://www.stylist.co.uk/books/unexpected-health-benefits-of-reading-fiction-books-reading-survey-stress-brain-agility. And supposedly Harry Potter readers are ‘better humans’ http://elitedaily.com/life/culture/science-says-kids-who-read-harry-potter-are-just-better-human-beings-in-general/691225/. 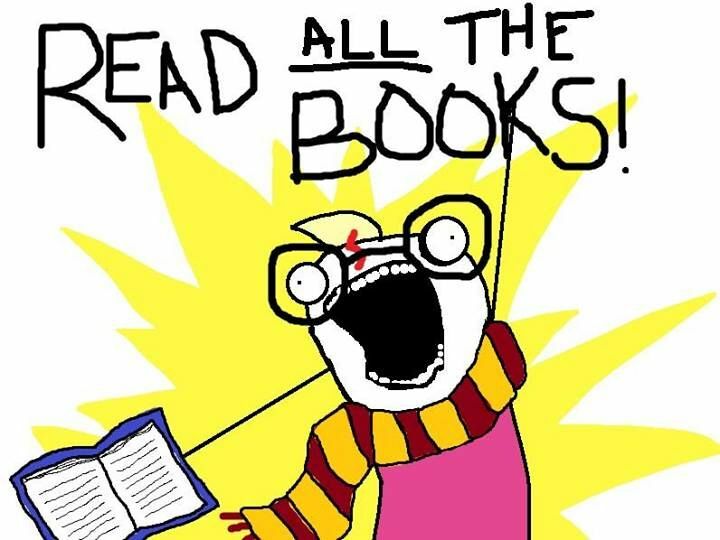 As a ginormous Harry Potter fan and member of the The Harry Potter Alliance – http://thehpalliance.org/ my bias may be showing again. But I’ve seen the HPA use the themes from Harry’s story to connect to real life and inspire social action. Science and art are not mutually exclusive subjects so even if you want to do maths as a living still read – it’ll make all the numbers come alive. If you have any comments or questions I’d love to hear from you. Saturday 27th October 2012 has been World Occupational Therapy Day and I am writing this in the closing minutes of the day which I celebrated by taking part in the special #OTalk organised by Gillian Crossley with Helen Rushton for the OT Global Day of Service on the role of Occupational Therapy in Public Health. I also attended a virtual classroom discussing Assessment and Social Media delivered by Merrolee Penman with Anita Hamilton. This was a test of the software for Tuesday 30th Virtual OT Conference which has the theme Occupational Balance. My plan for earlier in the day was to read some of The Casual Vacancy and despite enjoying the first few pages my body decided to let my eyes droop and I had a snooze instead. Then I nipped out to meet some friends. Tomorrow I am staying in! Not surprisingly I found myself to be occupationally overloaded (hence the daytime snoozing). 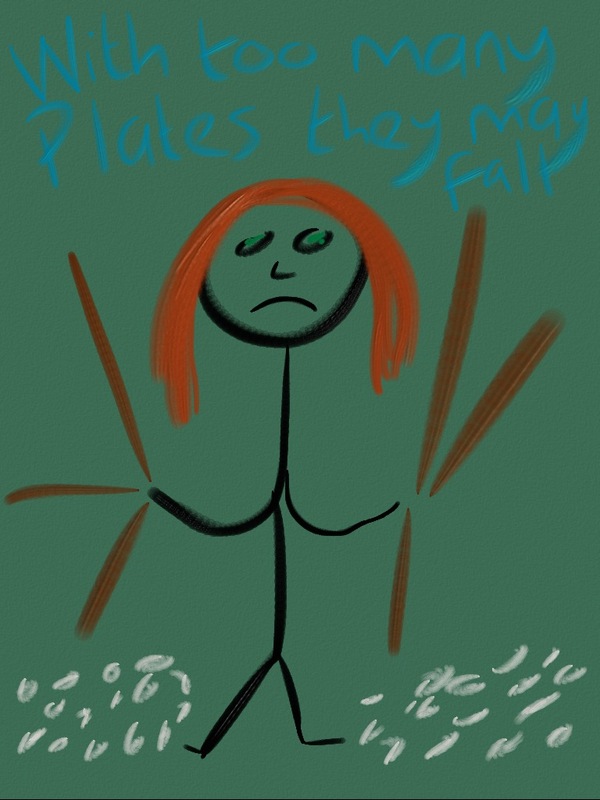 I decided to use some stick art to investigate why (inspired by the immensely talented Gillian). 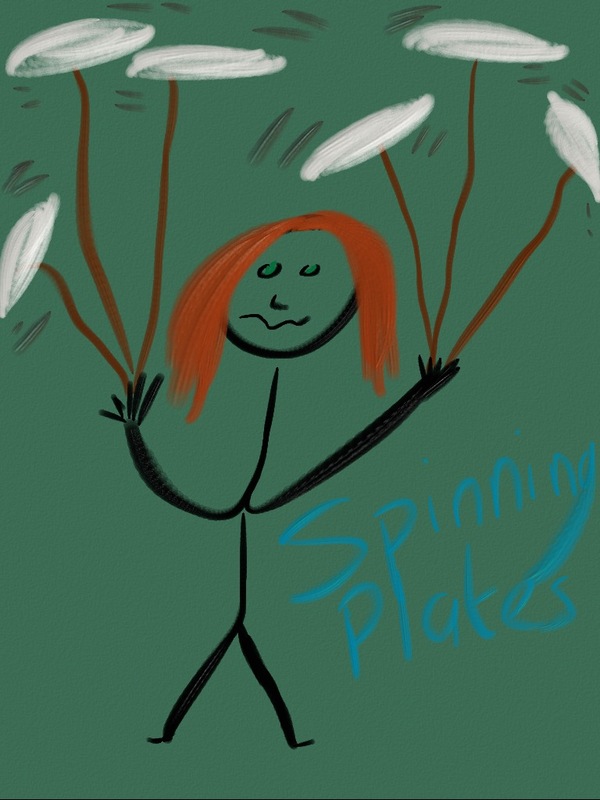 I get interested in things really easily and find that I pick up things and then try and balance them along with my desire to watch TV, read, write, sleep etc – my PhD supervisor used the imagery of spinning plates this week which I have borrowed for my pictures. But there comes a stage where this overload can become too much and things drop, and once you’ve dropped one thing, it can throw the balance of everything else off and you end up with broken plates. So what I’m trying to do is OT myself and gradually I am putting some of the plates down to one side or sharing them with others. November’s plan is to prioritise creative writing by participating in NaNoWriMo and my PhD. I’ve still got a way to go so I’d call it an evolving process of finding the correct balance (as you can see by from today’s effort ;o) – but I get an extra hour in bed because the clocks go back shortly). I was planning to write this in time to submit to Linda’s OT Blog Carnival but decided to prioritise and get some sleep. You can find the other wonderful entries here though -it does seem that balance is something that doesn’t come easily in today’s society (and OTs themselves need to work at this too). So – who here finds themselves overloaded and what do you plan to put down/share? If you already have great balance please share your secret.